Former Red Devil Bas Nooij is playing for The Kingdom of the Netherlands in the World Baseball Classic. Former Lower Columbia College baseball player Bas Nooij has been selected to play for The Kingdom of the Netherlands in the World Baseball Classic. Nooij came from The Netherlands to play at LCC from 2007-08 and later played at Hawaii Pacific University for two years. 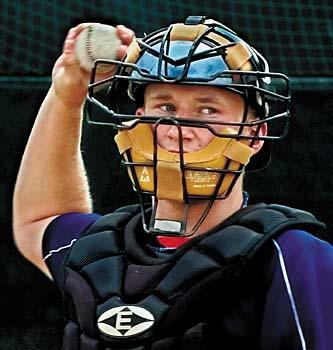 No stranger to international competition, the 25-year-old Nooij was one of five catchers under consideration for the Dutch national team in the 2009 Baseball World Cup. Nooij was selected as a replacement for backstop Spencer Kieboom, who recently underwent Tommy John elbow surgery. Last season as a member of the L&D Amsterdam Pirates, Nooij hit .296 with two home runs, 25 runs and 25 RBIs in 31 starts. The WBC, which began in early March, has The Netherlands competing in Pool B against teams from Australia, Chinese Taipei and Korea at Intercontinental Baseball Stadium in Taichung, Taiwan. The Netherlands, coached by ex-Major Leaguers Hensley Meulens and Bert Blyleven, also includes current Atlanta shortstop Andrelton Simmons and former MLB players Andruw Jones and Wladimir Balentien. • Another LCC student-athlete, Colin Bossio, was recently selected to the NWAACC all-academic team for winter quarter. Bossio, a guard on the mens’ basketball team, has a 3.98 grade point average, the second-highest GPA among 23 hoop honorees in the NWAACC. • Ex-LCC men’s basketball player Ian Ward, now attending Peninsula College in Port Angeles, also earned All-Academic honors with a 3.34 GPA. • Toutle Lake grad Anthony Heintzman, a freshman at Southwestern Oregon College in Coos Bay, was named to the NWAACC Southern Division second team in men’s basketball. Heintzman, also named the division’s Freshman of the Year, averaged 13 points and 3.5 rebounds. He netted a season-high 28 points in victories over Chemeketa and Linn-Benton. • Ex-Mark Morris standout Sean Atkins, a junior forward on the George Fox University men’s basketball team, earned first-team accolades from the Northwest Conference. Atkins led the Bruins in scoring (16.7 points), steals (1.88), blocked shots (1.2) and free throw percentage (.811). He was second in shooting (.467) and rebounding (5.3), led the NWC in blocked shots, was third in scoring and steals, fourth in free throw percentage, eighth in rebounding and 13th in shooting percentage. • Another former MM basketball player, Dalton Thacker, was named Freshman of the Year and earned first-team honors in the Cal-Pac Conference. Thacker, a redshirt freshman point guard, averaged 9.8 ppg and led the conference at 3.1 assists per game. • Kelso’s Adam Scalesse, a junior at the Coast Guard Academy, was recently named the CGASports.com Athlete of the Week for his performance at the All-New England Championships at Boston University. Scalesse set a school record in the 60-meter hurdles in 8.11, good for eighth place and All-New England accolades. The time is third-best in Division III this season, and earned him an invitation to the NCAA Division III Indoor Track and Field Championships in March in Naperville, Ill.
Rick McCorkle is a sports writer for The Daily News. If you know of a college athlete not mentioned in this column, email rickmc@tdn.com or call 577-2529. Dominican University first baseman Kayleigh Klingberg has found her niche both in the classroom and on the softball field.